‘Una pregunta chafa’ – a useless question – said the old lady to her friend after we checked we were at the correct bus stop. Thanks lady! (we’ve only ever walked to Lanjarón). The bus from Órgiva took 20 minutes, snaking its way past olive mills and rolling hills until, spectacularly, Lanjarón came into view. From above, the town must look like a broad grin – the white houses stretched thinly along a curved ridge. 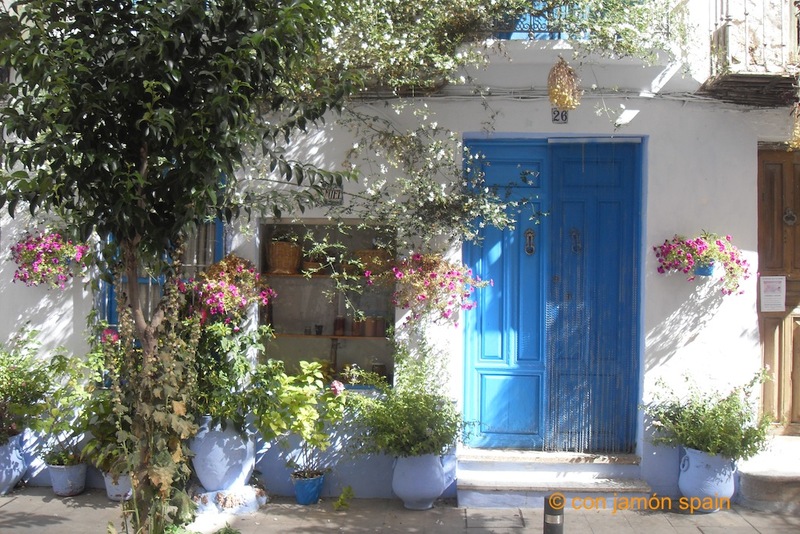 Lanjarón – its Arabic name Al-lancharon means ‘field of healthy springs’ – is dominated by a long main street (Avenida de la Alpujarra) which meanders from one end of town to the other via a lovely square in front of the town hall. This sleepy, smart town is peppered with jamón shops, cafés, panaderías, hotels – and an inordinate amount of florists and hairdressers. 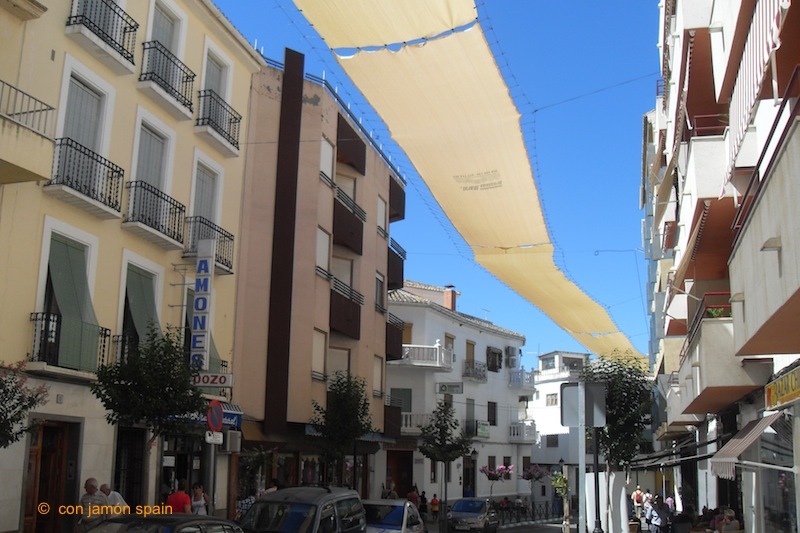 It’s the height of summer and huge sail-like covers, shading the street below, attempt to drop the temperature by a degree or two. 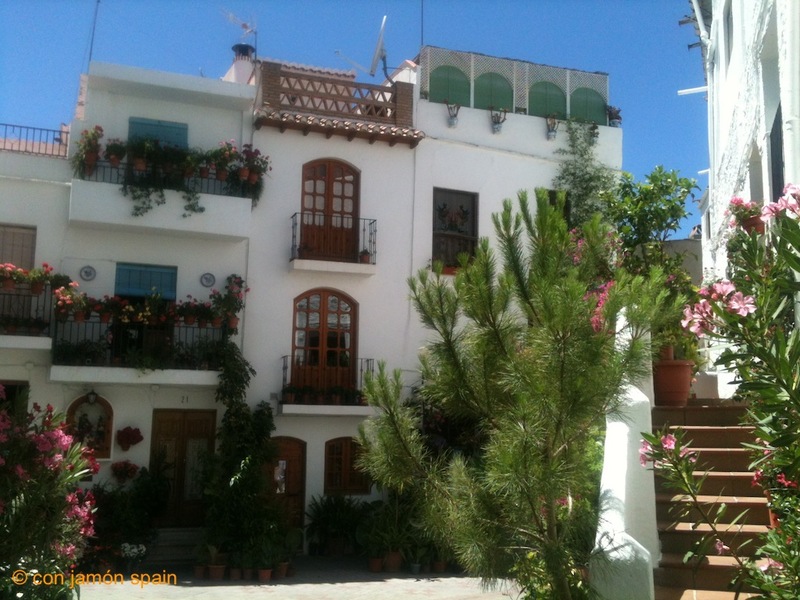 Almost every building is decorated with beautiful plants and flowers, giving a lush and verdant look to the main street. Lanjarón is Órgiva’s upmarket cousin. It’s less scruffy, more taken care of but lacks the eclecticism of its relative down the road. We imagine people who live here probably don’t like Órgiva. It seems more Spanish – and is full of old people. In fact, think The Twilight Zone, where everyone aged between 16 and 60 has been removed for some sinister experiment – and you have Lanjarón. This is a spa town famous for its water which arrives from the Sierra Nevada via five springs. It’s sold all over Spain. The spa itself, the Balneario de Lanjarón, offers treatments for ailments as well as pampering. It attracts coach-loads of visitors looking for the elixir of life. This is mainly what the hotels cater for (Hotel Miramar, €50 per night, per couple including breakfast). Lanjarón is also famous for its water fight on the eve of San Juan – you can read about it on Spain for Pleasure. A stroll down the side streets off the main street is a must. 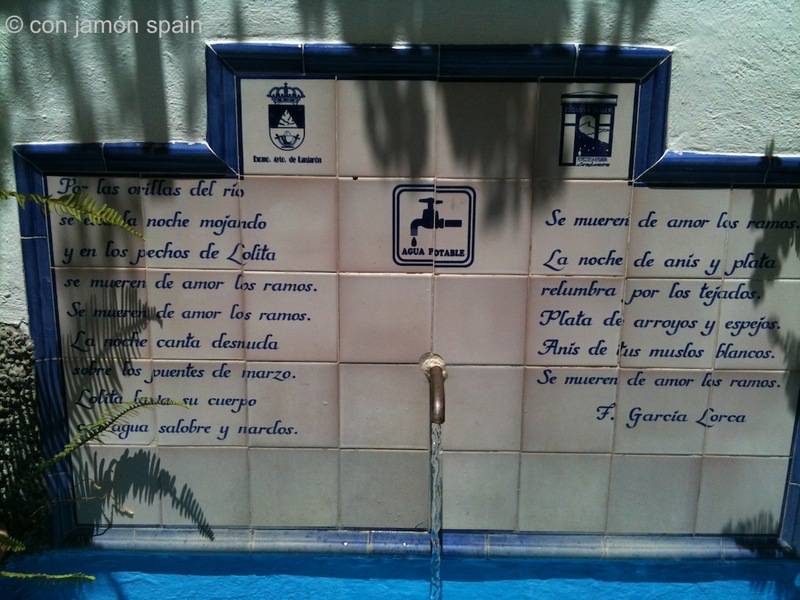 The whitewashed townhouses shade tiny alleys filled with geraniums and fountains which are tiled and decorated with poems by Federico García Lorca. Bring your water bottles and fill up for free (Agua Potable = drinking water). We stopped off at Café Suizo which opened in 1915. It serves good coffee in old-fashioned surroundings and, with a nod to the present, has decent Wi-Fi. There’s a menu del día for €9.50 which looked good, but we had our radar set to seek out our favourite place to eat. We popped into a Tabac the size of a postage stamp but which managed to include a promotional cigarette stand, complete with beautiful girl offering cigarettes to those who entered. Spain has a long way to go before it enters the realm of non-displayed and plain packaged cigarettes. It’s common to see a gaggle of adults in a restaurant or bar all smoking around their toddlers and babies. It’s like being back in the 1970s. Next stop is Jamones Gustavo Rubio. 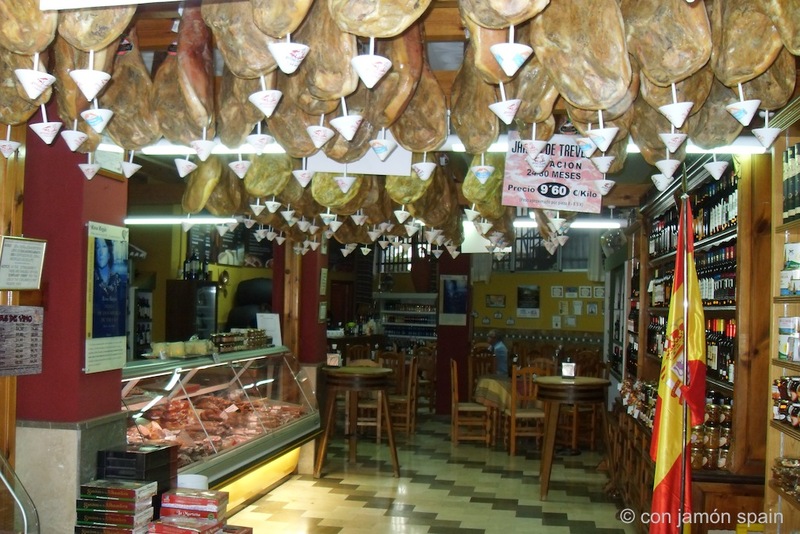 Jamones dangle from the ceilng, a large deli counter displays cheeses and cured meat, and there are shelves of wines and sherries. At the back are giant black barrels. We order a white Macebeo Alpujarra and a Nevarra Rosado (both recommended) which come with a tapa of large slices of cured ham with tiny olive tapenade tostadas – and crusty bread. 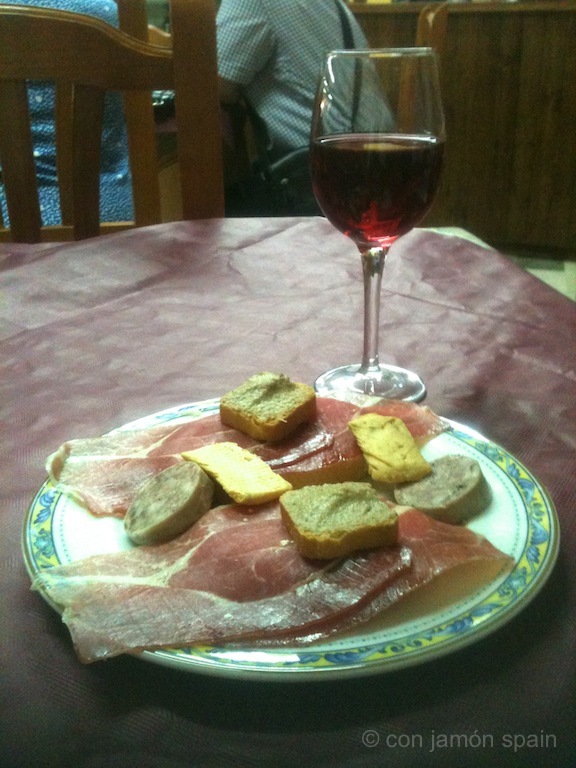 Next we have another Macebeo and a Vino Naranja accompanied by a plate of mixed meats including chorizo and lomo. We complete the meal with another wine and a plate of local sheep cheeses with roasted sweet almonds, a fabulous combination. Wine costs €1.90 to €2.20 a glass and includes a tapa. So a tasty tapas lunch can be around €6.50 per person. Takeaway wines and sherries from the barrel are €4.60 to €5.60 per litre. Lanjarón is worth a visit and there’s more to see than we did – like visiting the spa and the ruined Moorish castle. We amble up to the bus stop at the top of town (on the route out to Granada) for the 2.45pm back to Órgiva. The first time we did this we watched our bus leave without us, having taken the advice of a person who didn’t stop to think we were heading in the opposite direction to them. This time, we crossed for the Órgiva side of the road without having to ask another useless question. By the way, the bus from Órgiva to Lanjarón is just up from Dia supermarket. I haven’t been to this area of Spain yet…sounds really interesting. Closest I’ve been is Granada capital maybe. I’ll have to make a visit sometime. 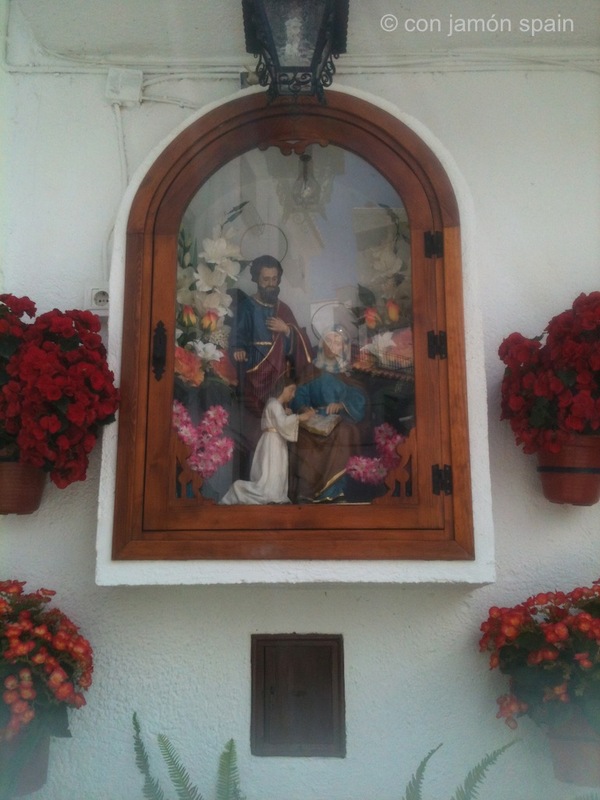 Most people head for Seville, Ronda and Malaga but Las Alpujaras are stunning, any time of the year.